...."We realize the impact of 50 years, the cycle of life, when we have done weddings for three generations within one family. And of course, all of the other life events, some sad, some joyous, that we celebrate with flowers." ...."There is a level of trust placed in us to take our clients' thoughts, ideas and emotions and translate that into a floral offering that conveys their feelings in a beautiful way." Richard Hatler knew he wanted his own shop when he worked part-time through high school for Paul and Maxine Adams in a florist shop located in a log house behind Highland Federal Bank, just off of Main Street in Crossville, TN. Upon the Adams' retirement in May 1961, Richard bought the business at 19 years old. He attended Cliff Mann Floral Design School in Colorado in 1961 and built the current fieldstone location at 202 Stanley Street in 1968. Richard has an instinctive design sense that has made his work much appreciated in the community. His brilliant use of color and design with flowers come together to create stunning floral arrange-ments. He is also well known for keeping only the best quality cut flowers in stock. While working to build his business locally, Mr. Hatler was also busy making a name for himself beyond Crossville. He served as president of the Tennessee State Florist Association and earned membership in the prestigious American Institute of Floral Designers. Richard was a guest designer at many trade shows and photography sessions where his designs were used for selection guides by the internationally known wire service, Teleflora. Hatler Florist & Gift Gallery has earned the honor of being placed in FTD's Top 500 or Top 1000 of all FTD florists nationwide every year since 1998!FTD (Florist Transworld Delivery) is an organization of about 22,000 members. 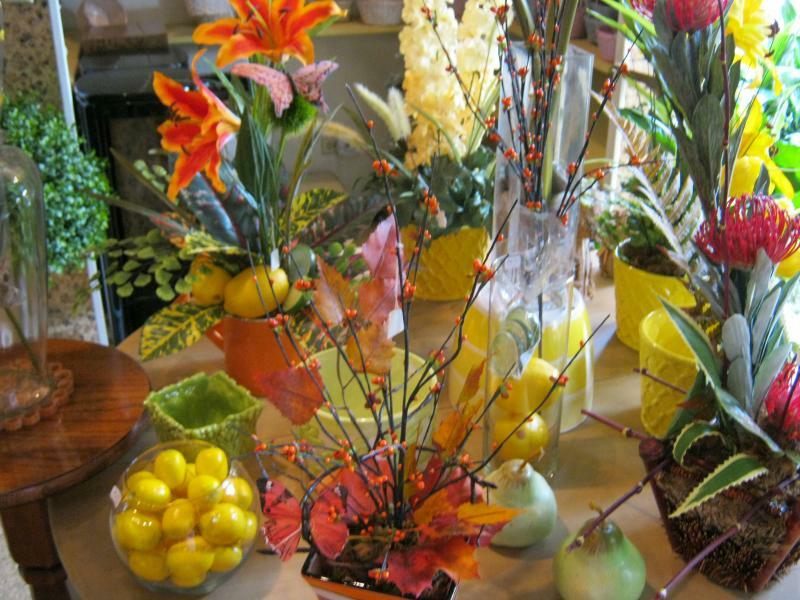 Natural light shows off these creative, airy permanent arrangements and cheery home decorating accessories in the gift gallery at Hatler Florist. Springy colors and accessories in the gallery. Silk zinnias look so real you'd think they were fresh picked from the garden! 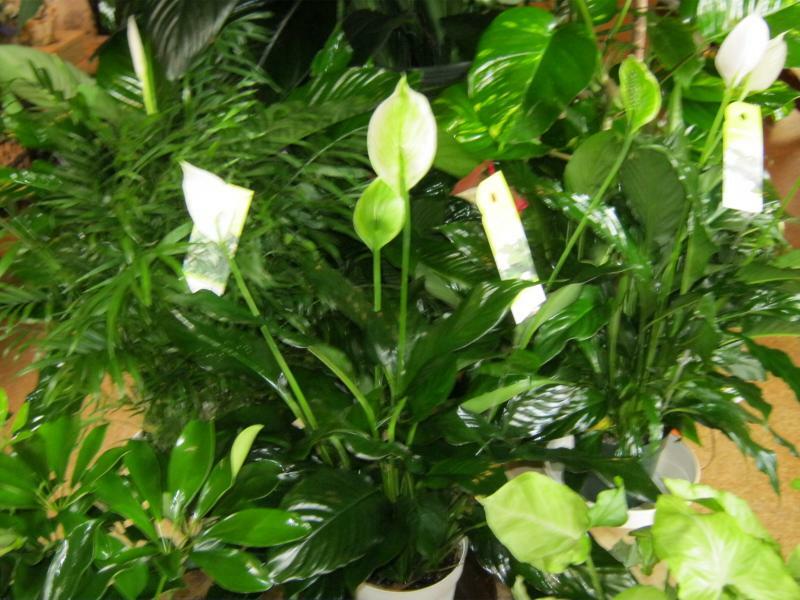 A variety of healthy green plants are always available to choose from in a range of sizes and prices. 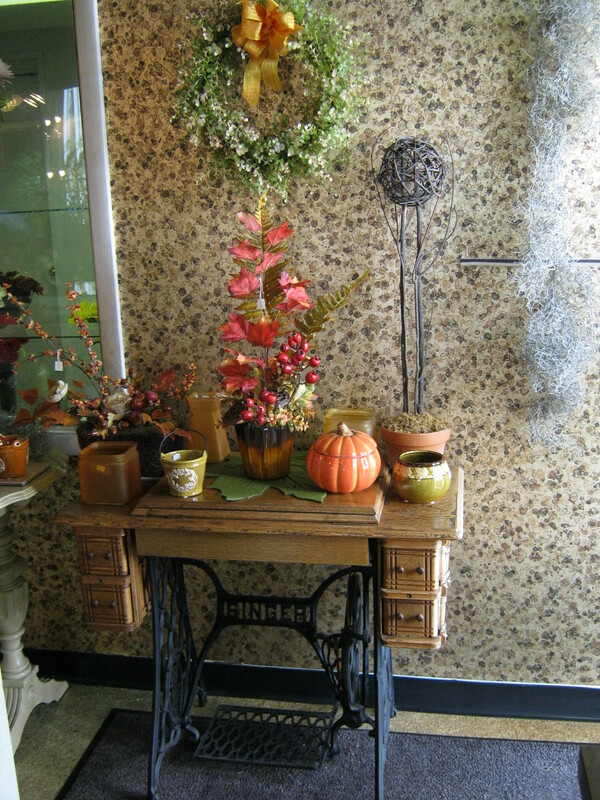 Decorative baskets and contain-ers are available to dress up a plant for presentation. Grandma Hatler's Singer sewing machine, used as a display piece in the showroom. Like her brother Richard, Nancy began working in the business part-time while attending high school at CCHS. She won a scholarship contest to attend Cliff Mann Floral Design School in Denver in 1975, and has been a full-time employee with her brother ever since. Nancy's own natural design skills are enhanced and inspired as she regularly attends area floral design shows. She's recently completed workshops in design areas such as wedding and prom, spring and summer seasonals, fall and winter holiday design and more. "My goal is to offer customers the latest in styles and products so they look not only visually appealing, but also stay fresh longer for maximum enjoyment," says Nancy. Sharon, another of Richard's sisters, joined the business full-time in 1976. She does a great job organizing and handling the bookkeeping duties, helps with routing deliveries, and is in charge of customer service, computer operations, and sales for the shop. Scott has been an essential part of Hatler Florist since 1987. 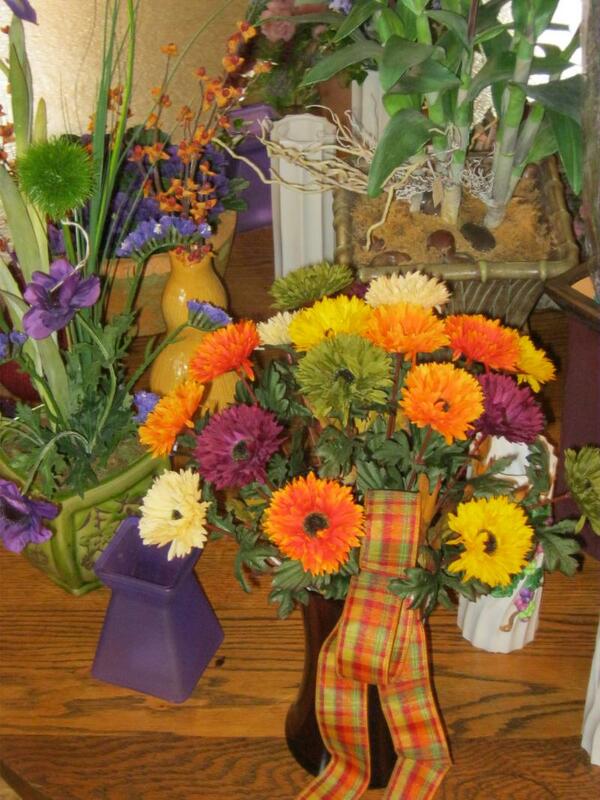 He knows Cumberland County roads like the Crossville native he is, and takes pride in arriving at delivery destinations with flower arrange-ments that look just as good as when they left the shop! Scott also has a natural sense for design, and regularly contributes to silk flower designs for the shop, and creates beautiful window and shop displays for the gallery. Scott is also in charge of all our wedding and event installations. Scott Hoover became an official Hatler family member in 1995 when he and Nancy Hatler were married. Glinda began working part-time in the shop in 1982 and quickly became invaluable at helping both our floral designers with prep work. She moved to full-time in 1986 and is a great asset to the workroom at Hatler's. Glinda also pitches in to help with any other projects that come up in our busy workroom. A longtime family friend, Becky started working full-time at the florist in 1993. Becky helps Sharon with customer service, computer operations, and bookkeeping duties. Becky also pitches in as a work-room and delivery assistant. With Special Thanks: to so many others, friends and family members who have helped out the family business cause off and on over the years: Frank Rizzo, Ronald Hughes, Barbara Coleman, Doris Shanks, Joyce Threet, Leah Threet, Dennis & Dorine Hatler, Lynne Hatler, Valerie Selby, Lynsey Crawford, Buddy Hoover, Brenda Farris, Kaye Randolph, Gayther Cook, Marc Lipner, Morean Randol, Judy Nagdeman & Winston Clouse. In Loving Memory: We so miss our longtime former employees Joyce Hughes, Polly Thompson, Louie Vitatoe and Angie Hoover. We have many, many fond memories of the years when they were part of the Hatler family. Also, we remember the integral part of the shop that our parents were. A.H.(Dock) and Lelah Hatler will always be missed and loved by us all. Mom's sister, our dear Aunt Virginia Bowman is deeply missed by us all. We also fondly remember our grand-parents, Richard & Minnie Hatler and Lee & Clara Walker. They were all so proud of their grandson's business accomplishments. We love you & miss you all.